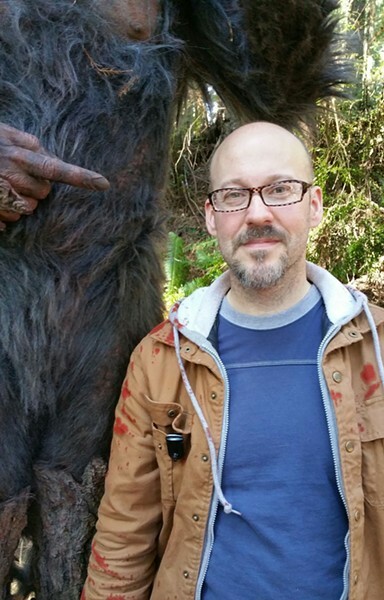 Co-producer Edward Olson hanging out in the Humboldt woods with Bigfoot. If you brave tomorrow night's North Coast premier of Primal Rage at the Eureka Theater, you might see a familiar face. No, not the shadowy figure from the Patterson-Gimlin film — Edward Olson, a Eureka High School alum and co-producer of the new Bigfoot feature, which is set for release nationwide on some 500 screens via Fathom Events, including the Minor Theater in Arcata. 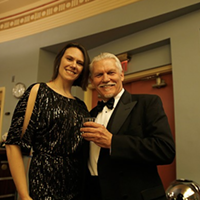 Olson, a theater kid back in his Logger days, has been making a living in and around seemingly every part of the film industry in Los Angeles: writing and producing his own short films, working as an assistant cameraman and an extra, and making featurettes for movies. Everything except sound, he says. "Actually," he adds with a laugh, "thats not true, I was a boom operator once!" It's a broad resume that came in handy on the Primal Rage shoot, with a crew of fewer than a dozen doubling and tripling up on duties. Olson wound up taking on far more production responsibilities on site, "which is why, eventually, I was promoted up to co-producer," he says. Olson returned to Humboldt to work on Primal Rage, which filmed in our county for three weeks in 2015 and another three weeks in 2016. "The Bigfoot movie wasn't my idea but I was basically hired because they needed someone who knew the (Northern California) area," he says. The filmmakers wanted to shoot in the redwoods, so Olson pointed them to Humboldt-Del Norte Film Commissioner Cassandra Hesseltine to coordinate. While they considered shooting in state parks, it was too difficult to move around freely and it would have required the constant supervision of parks staff. Finally, they settled on the Palmer Westbrook Ranch on the Smith River, which you can also see in E.T. : The Extra-Terrestrial. The plot centers on a couple (Casey Gagliardi and Andrew Joseph Montgomery) who get lost in the woods before running into a group of sketchy local hunters. Take a peek at the trailer here. The hunters, Olson says, are archetypes, but "definitely Humboldt people ... it's not representative of people generally in this area but they are representative of people you can find in this area." 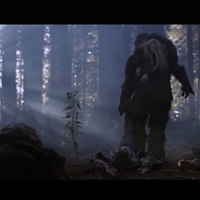 Then there's Sasquatch — or Oh mah in Hupa and Yurok — played by director Patrick McGee. The sheriff and deputy are both played by Native actors, the late Eloy Casados, whom you might have seen in everything from Walker Texas Ranger to Shameless, and Justin Rain, who appears in Twilight and Fear the Walking Dead. 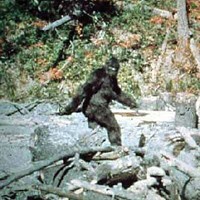 McGee, who is 6 feet 8 inches tall, is not a stretch as Bigfoot. He has acted in monster movies and his forte is in makeup, special effects and monster building, talents he lends annually to Universal Studios Halloween events. He's spent 10 years planning and creating the suit in the film, right down to fangs that drip and breath that puffs on cue. "The suit is so realistic as far as looking like an actual animal," says Olson. "He looks like a big animal with giant fangs, not human eyes, not a human face ... it brings him up to 7 feet tall. The suit is so advanced and well made ... it looks like a real beast. It's pretty convincing." Still, he says, the cast and crew resisted any cryptozoological pranking; it's just too dangerous. "I think we all knew how badly that could turn out." At the screening, Olson will share some behind-the-scenes footage of McGee directing in costume. So is Olson himself a believer? Sorry, big guy, but Olson says he thinks somebody would have found you by now. He chuckles. "I'm the Scully of the operation."